Pulse 1.5 cups of the ricotta with the parmesan, egg, egg yolk, and salt in a food processor just until smooth. Sprinkle flour over ricotta mixture and pulse again until just combined. Transfer dumpling batter to a medium bowl. Bring a large pot of lightly salted water to a boil. Add asparagus and cook until almost tender, 2–3 minutes. Transfer to a bowl of ice water; drain and pat dry. Reserve pot. Meanwhile, bring chicken stock to a simmer in a large skillet over medium heat. Return pot of water to a gentle simmer and add dumplings (one by one so they don’t crush each other), stirring occasionally, until they’re almost double in size and cooked through and tender, about 4 minutes (dumplings will quickly float to surface). Transfer dumplings to pan; add butter and green garlic. Cook, tossing often, until sauce has thickened and garlic has slightly softened, about 3 minutes. Add asparagus, chives, and lemon juice and toss to warm asparagus; season with salt and pepper. 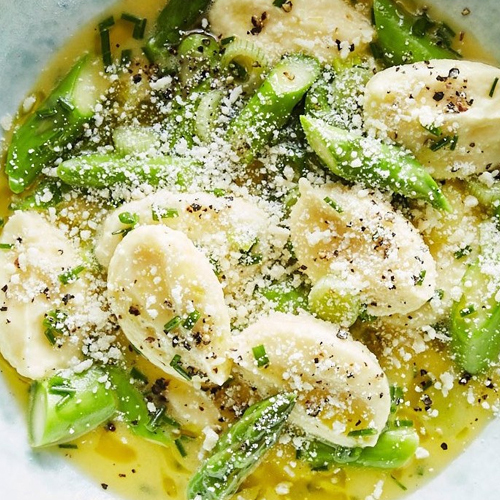 Serve dumplings with more cheese and drizzle with olive oil. Preheat the oven to 170C. Grease a standard loaf pan and set aside. In a medium bowl, combine the flours, baking soda, and sea salt. Set aside. In the bowl of a stand mixer fitted with the paddle attachment, beat the butter on low until it’s pale and light, about 3 minutes. Add the sugar and continue to beat until fully combined. Scrape down the sides, and then mix in the eggs one at a time. Next add in the bananas, yogurt, and vanilla. 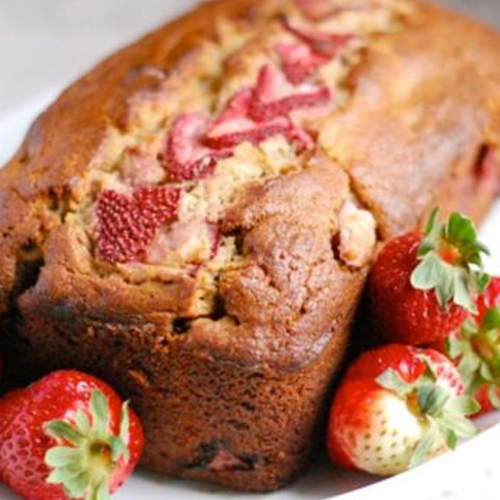 Fold in the flour, and then strawberries, mixing just until combined. 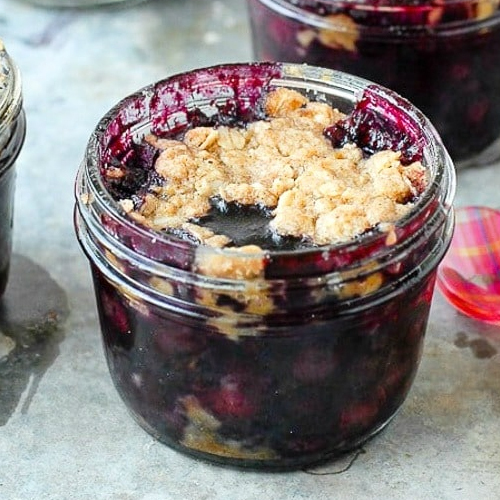 If you’d like, reserve a few berries for the top of the bread. Pour into the prepared pan and bake for 60 – 70 minutes, or until a toothpick inserted in the middle comes out with just a few crumbs attached. My bread browned considerably in the oven check bread towards the end and tent edges with foil if needed. Cool for 20 minutes, remove from bread pan, and cool 40 minutes more before serving. Bring a large pot of salted water to boil. Add the pasta and cook until al dente, following the instructions on the package. Plunge into an ice bath, drain, and let cool. Bring another pot of water to boil. Drop the tomatoes in for about 1 minute, until their skins split. Transfer them to a bowl of ice water to stop the cooking. Once cool, peel the skins and remove the seeds. In a food processor or blender, combine the peeled tomatoes, basil, celery leaves, parsley, salt, garlic, almonds, pepper, and olive oil. Process until smooth. Shuck the corn and slice the kernels off of the cob. 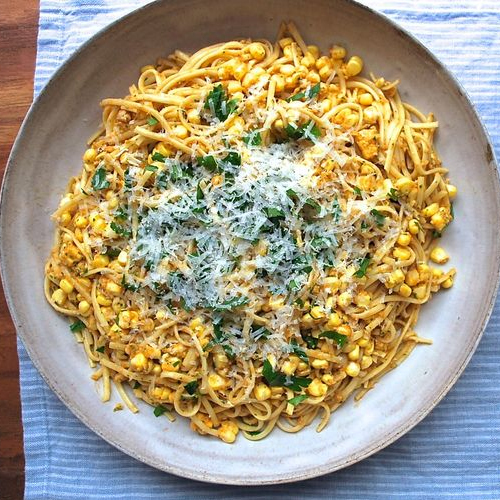 In a large bowl, toss the pasta with the sauce and the raw corn. Serve topped with chopped parsley or grated Parmesan.